Executive Suite all feature separated bedrooms with spacious living rooms. Guests will experience luxurious bath amenities with a marble vanity and tub with shower. 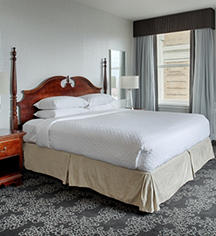 These suites are located on the top two floors of the Embassy Suites by Hilton Portland Downtown. 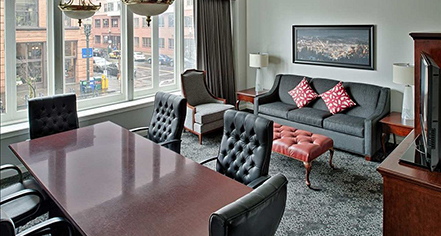 Guests are treated to spectacular views of the downtown skyline and plenty of natural light. In 600 sq ft of living space, the suite features a separated bedroom with two queen-size beds and luxurious amenities. This city-view suite offers 600 sq ft of space offers stunning downtown Portland skyline views and a separated living room and bedroom with a king-size bed. Located on the mezzanine level, this Conference Suite offers over 800 sq ft of living space with a living room and a boardroom table which seats six people. The lofted bedroom area is separated from the living space and includes a king-size bed.